The Financial Times has a new owner. Japanese publishing group Nikkei Inc. is paying Pearson (PSO) £844 million ($1.3 billion) in cash for the Financial Times Group, which includes the famous pink newspaper, luxury lifestyle magazine How to Spend It, and a range of specialist titles including The Banker and Investors Chronicle. Pearson said it was selling the FT Group to concentrate on its primary business -- its educational textbook and publishing unit. It said the media industry had reached "an inflection point" driven by explosive growth of mobile and social. "In this new environment, the best way to ensure the FT's journalistic and commercial success is for it to be part of a global, digital news company," said Pearson CEO John Fallon in a statement. The deal does not include Pearson's 50% stake in business and current affairs weekly The Economist. Pearson is also holding onto the FT's headquarters at a prized riverside location in central London. Apart from its flagship Nikkei newspaper, the new Japanese owner also has interests in digital media, data services and broadcasting. 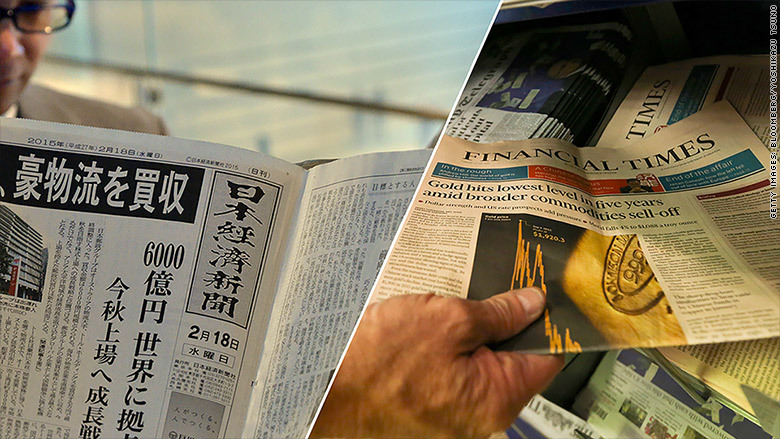 "We share the same journalistic values," said Nikkei CEO Tsuneo Kita. "Together we will strive to contribute to the development of the global economy." The sale has long been the subject of media speculation. Others rumored to be interested in buying the paper had included media company Bloomberg, Thomson Reuters (TRI), and Germany's Axel Springer. Pearson said circulation at the FT -- founded in 1888 -- had grown by 30% over the past five years to 737,000. Digital now accounts for 70% of that, with half of all traffic being driven by mobile. The FT Group had sales of £334 million in 2014, and made an operating profit of £24 million. The deal is subject to a number of regulatory approvals. Pearson expects it to be completed in the fourth quarter of 2015.